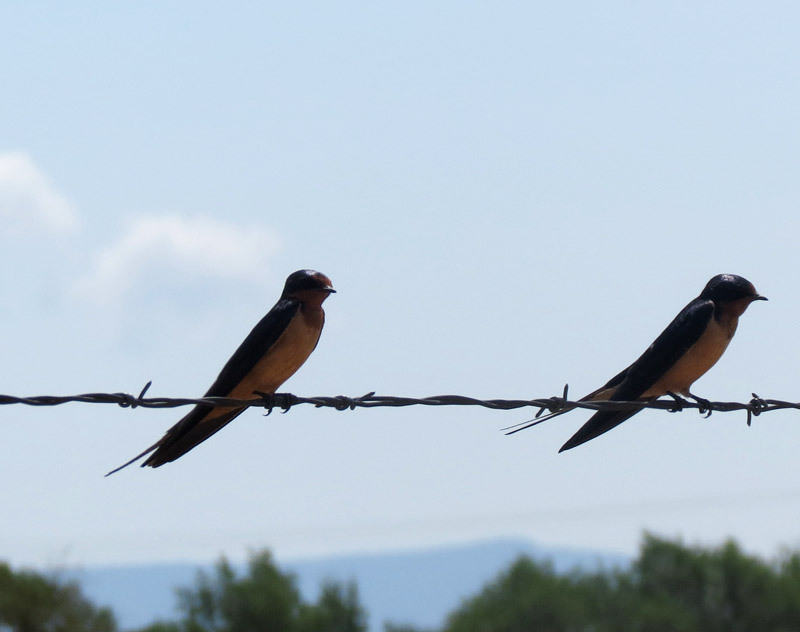 Six months ago I rejoiced when I spotted a Barn Swallow swooping over the Candelaria Wetlands at the Rio Grande Nature Center State Park – my ‘first of season’ sighting, a sign that spring had arrived. Long distant migrants, Barn Swallows winter throughout Central and South America, following the coastline as they make their way north. When I visited the Valle de Oro NWR a few days later, Barn Swallows were already busy scooping up mud in the bottom of the still-empty, but damp, acequia to build their cup-shaped nests on beams under the eaves of the out-buildings. After getting a mouthful of mud, the swallow makes a stop in the field to capture a bit of grass to reinforce the mud pellet. Building a nest requires up to 1,000 trips from the mud source to the nest site. It will eventually be lined with feathers, fur or other soft material. It is strong enough to serve the parents for more than one clutch. Both males and females participate in the nest-building. Between nest-building trips, they may pause to rest on the nearby fence wires. 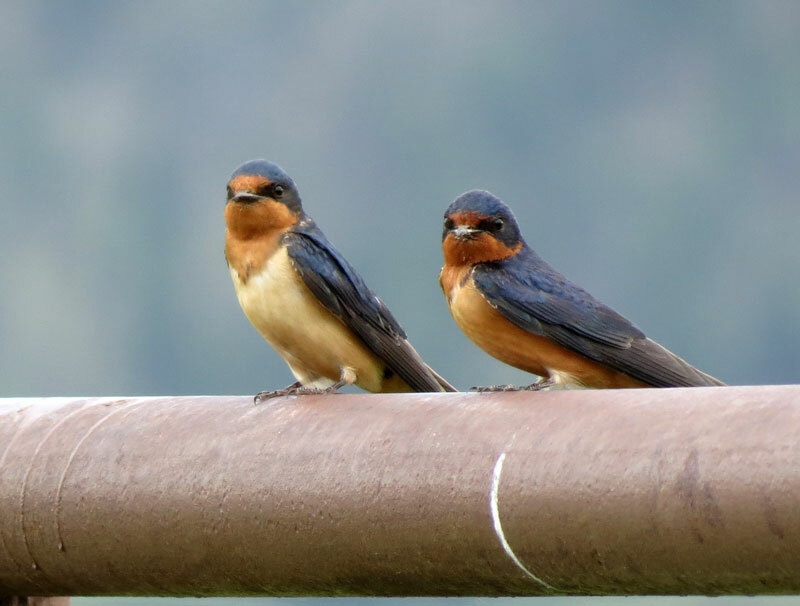 Each week as we counted the bird species at the Rio Grande Nature Center State Park, our team enjoyed watching the swallows coursing low over the pond capturing insects as they fly or scooping up a mouthful of water. They tend to pause in their feeding in small flocks, lining the branches of small trees on the far side of the pond. After a few minutes rest, they are off again swirling over the water. 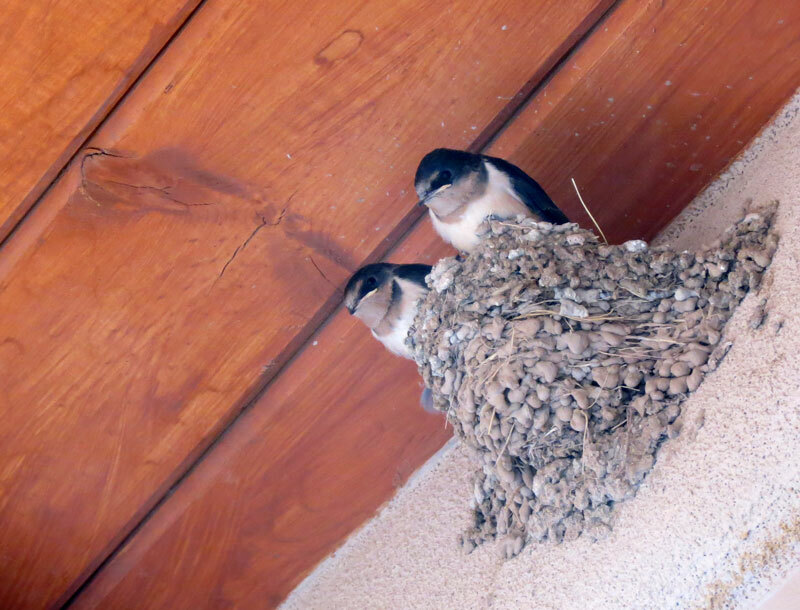 By the end of June the nest under the eaves of the Visitor Center at the Valles Caldera had some fuzzy heads and parents were whizzing back and forth to the nest. 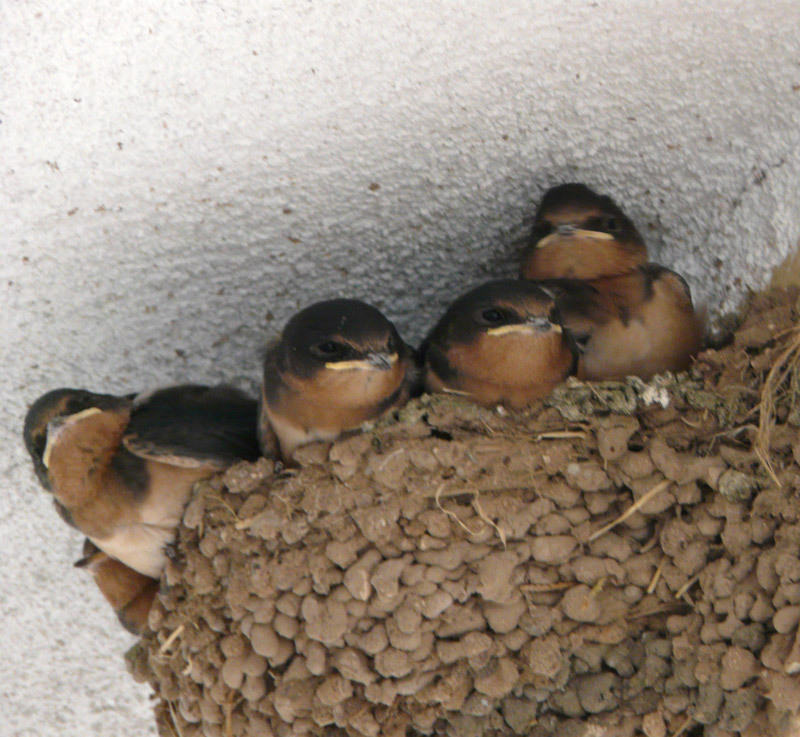 Barn Swallows may feed their nestlings up to 400 times a day. And pairs of adults rested on corral fence. When I visited again a month later, the first brood had fledged and females were incubating a second brood. Most nests that I observe have an average of four chicks, although I have seen nests with as many as six. 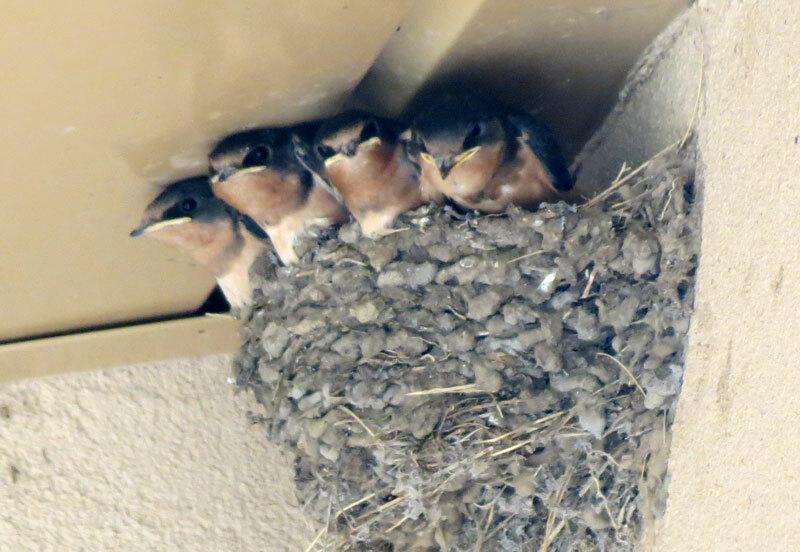 While Barn Swallows have an extended breeding season and can have more than two clutches, particularly at southern latitudes, Barbara Hussey and I were surprised to find a nest with four chicks outside the entrance to the Visitor Center at the Las Vegas NWR on September 11. We watched as parents zipped in and out bringing food.The chick’s gape gives the impression of a constant grin. As I emerged from the mini-mart at the Santo Domingo Pueblo on September 24, I noticed Barb looking up. She motioned to a nest under the eaves where four chicks were practically hanging out of the nest. There were two chicks looking anxious and calling frequently. “Looks like a case of ‘failure to launch,’ trip participant Beverly laughed. I went back to get my camera. As I returned to the car after purchasing my snack, a troop of swallows whizzed through the portal, calling as they passed the nest. “I wonder if they took the hint and left,” I commented and wandered back to look. There was only one chick left – calling forlornly. 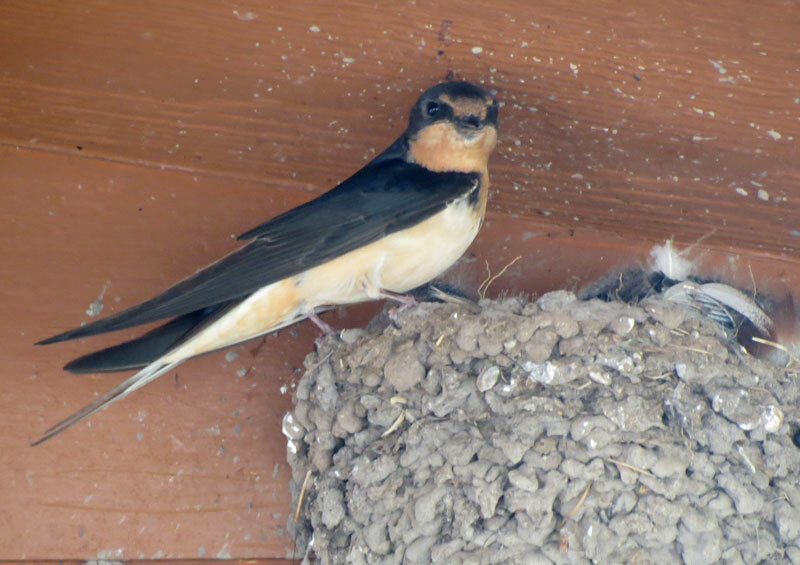 The last of the Barn Swallows are normally on their way by the end September and I am sure that this family was anxious to leave, but didn’t want to leave one of their offspring behind. It was a long day and I couldn’t stick around to watch, but hope that the remaining chick finally joined the rest of its family. really appreciate the reflection on multiple sightings, to know the bird’s behavior better – thanks so much, Judy!